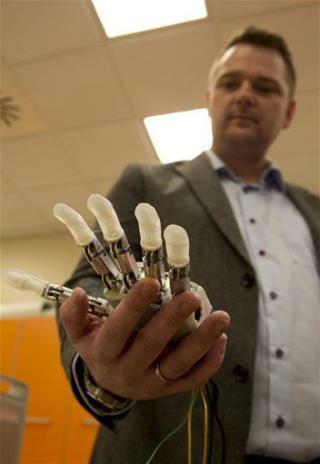 (Newser) – In an amazing leap forward for prosthetics, a Danish man has become the first person ever to feel something with a bionic hand. The hand contained sensors directly connected to nerves in the upper arm of Dennis Aabo, whose left hand was blown off in a fireworks accident nine years ago, LiveScience reports. Over a month of tests, Aabo, who was sometimes blindfolded, was able to feel lifelike sensations in the hand and determine the size of objects that he picked up. He says the hand was "amazing." Ha, they wouldn't've taken "my" new hand back. Do we need the Human race anymore ?